We hope all of you had an enjoyable Fourth of July. First, let me update you about the fire. As of this morning, it was 90% controlled. No more structures have been lost since that horrible Tuesday, June 26. A total of 346 homes burned down with two deaths at one residence. No firemen have been hurt. I didn’t spot any smoke today. Last night the community held a huge benefit at the Colorado Springs World Arena. We didn’t go but were able to watch it on television. It featured the Colorado Springs Philharmonic and the Flying W Wranglers (from the attraction that burned down). Another act was a 60's Classic Rock group that has performed together since 1969. It was excellent. Attractions are now open as is Route 24. Many attractions on the west side of Colorado Springs were evacuated, and it was impossible to go west on Route 24, so trips to Woodland Park and Cripple Creek were not available. The temperature has been in the high 90's here, with three days in the past two weeks at 100 or higher. Pueblo was even worse with temperatures of 106 to 108. It was easier to stay inside and enjoy the A.C. It is starting to cool down - actually cooler today. We can now become more active. That doesn’t mean we haven’t gone out. But not as much as, perhaps, we would have without the above conditions. We went to the Colorado Pioneer Museum on June 30. 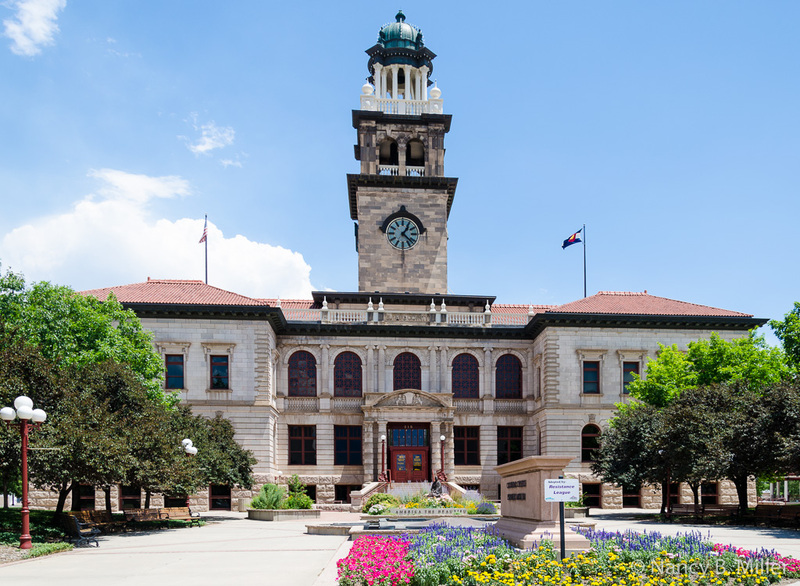 The museum is located in what was the El Paso County Courthouse from 1903-1973. They were going to tear the building down in 1976. The Historical Society got behind the salvation project and succeeded in not only saving the building but creating a high quality museum. Many interesting exhibits are on the second floor. Earl particularly enjoyed the display which related in words and via artifacts the history of photography from early times to the present. It had everything from stereoscopes to old Nikons and Leicas. Van Briggle factory. They specialized in a matte finish and an art nouveau style which featured the colors and plants found in Colorado. They were a major pottery in Colorado until their closure a few years ago. Another excellent exhibit included a small room filled with Pikes Peak souvenirs of all types. It covered how Pikes Peak was marketed to the public. You can learn about the cog train, how the road was constructed, and about the automobile and human races they hold. Before we headed to the third floor in a 1913 Otis Elevator, we checked out exhibits on bicycles and a large display of early Colorado Springs photographs. On the third floor, you can learn about those who settled this area - the farmers and miners. You’ll see the early tools of doctors and dentists, find out what an early pharmacy was like, discover the mineral springs of Manitou, and learn how TB, so prevalent in this area in the early 1900's, was treated. Read about Helen Hunt Jackson, a writer, who lived between 1830 and 1885. She came from Amherst, Massachusetts and lived in Colorado Springs between 1873 and 1874 where she sought a cure for tuberculosis. She was well known for her writings about injustices to the American Indians. Her best-known book was “Ramona” which was reprinted 300 times. Her Colorado Springs home was torn down in 1961. Part of the exterior along with three rooms of her furnishings were saved. You can visit them on this museum’s third floor. 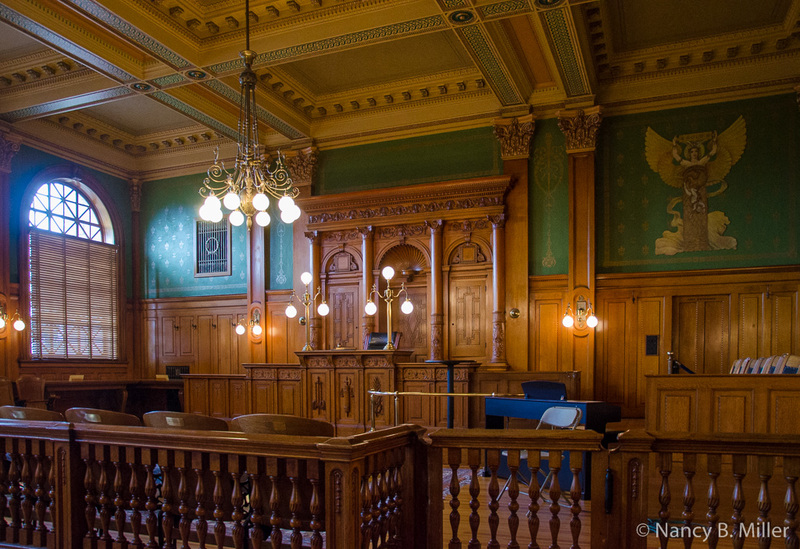 Finally, take time to walk into the courtroom and visualize the television show Perry Mason. The show filmed some of the episodes in this room. The only problem with this museum is that nearby parking is metered. Which means, it’s necessary to watch the clock. We found two hours to be about right. So that was last Saturday. On Sunday, we joined Bob and Marjorie Card for a holiday concert called “Of Thee I Sing” at the First Presbyterian Church. They have an excellent choir - about 100 members. They also had a band - three trumpets, a flute, two guitars, drums, piano, and organ. The first 40 minutes consisted of patriotic songs while the remainder was gospel music. I saw presentations by people portraying Patrick Henry’s daughter and Katherine Lee Bates who wrote “America the Beautiful.” They had other people representing Washington, Lincoln, and Buffalo Bill Cody. 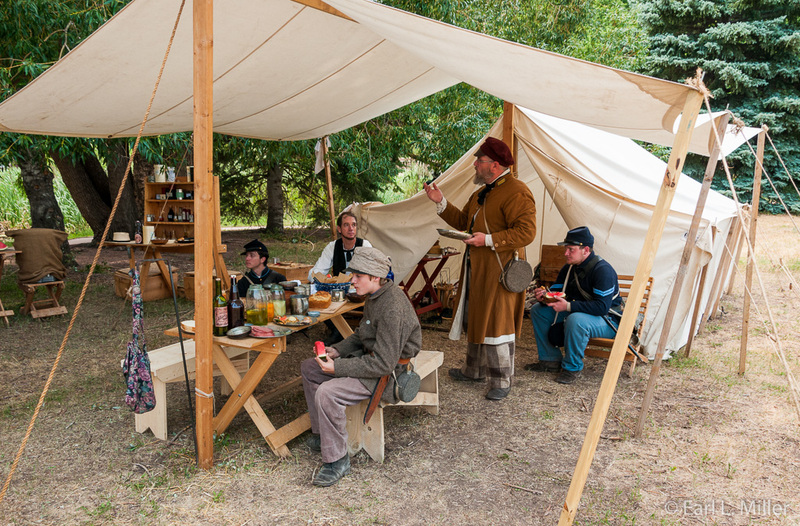 They set up a Revolutionary War and a Civil War encampment. Colorado’s 2nd Regiment during the time of the Civil War helped fight against Mexico when our southern neighbor started causing problems. The Fountain Creek Brass Band played patriotic music. The site has several restored homes. The Orchard House representing 1907-1910 was owned by General Palmer. It was used for farming operations. 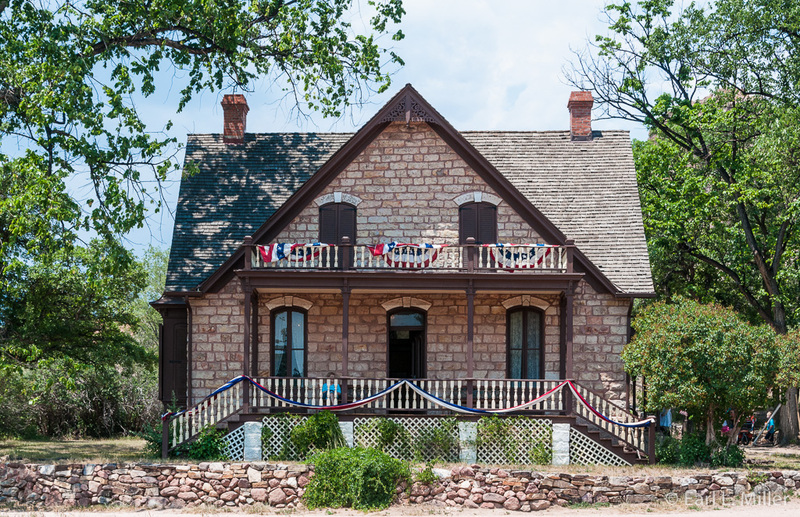 The Chambers Farm and Rock Ledge House represents 1874-1900. Palmer bought it in 1900. At that time, it was one of the best producing farms in El Paso County. I have been very busy with that cross stitch I told you about. All the cross stitch is done and now I am doing extensive backstitching. The project is 21 inches long and 4 inches high. Earl spends a lot of time watching television, working on day to day financial records, and downloading and processing photos. Pierre is fine. He lets me know when he thinks I have done enough cross stitch by demanding an instant lap sitting and petting. He also loves to curl up with Earl. Today we stayed in. Thursdays have become laundry days around here. So that was the case today. We also got our photos up-to-date including labeling about 750. Some of you have asked to see the photos. But Earl likes to Photoshop them first so they aren’t ready immediately to send to you.